The Camp Boss thing started when Troy King was a regular fixture of the Hug-In. Troy's campfire was the nerve center of the Hug-In. Troy always had a pot of beans going for anyone who was hungry. Also, on the usually cold nights, everyone huddled around the campfire and the musicians plied their trade. It was a nice, friendly place. When "Uncle Troy King" went on to that camp in the sky, George took the reins of the chuck wagon. (We did an article on George and Luckenbach a couple of years ago. 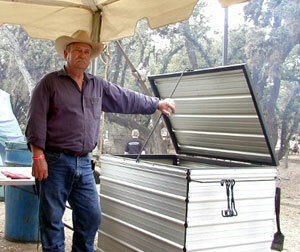 This year George brought along his brand new Texas Hill Country smoker to compliment his vast array of Dutch ovens. I have said for years that the Texas Hill Country smoker is the ultimate in smoker design and function. As you can see, the smoker is made with a framework of angle iron and is covered with sheet metal. (see photo 2) There are two grates inside. The top grate is about 38 inches above ground level and the second about 30 inches. The secondary grate serves two purposes: (1) to provide extra space for items being smoked, and (2) a container of coals can be placed on it to make the top grate into a grill. At the rear of the smoker, below the sliding secondary grate is the access door for adding coals. (Photo 3). The THC smokers do not have the fire built inside of them. The fire is nearby and coals are placed in the smoker with a shovel. Two heaping shovels of coals will bring the smoker up to cooking temperature in a short time. Essentially the THC smoker is a closed box. Enough air seeps in through the various openings to keep the coals going just right. At Luckenbach, the coals for the smoker come from the fire ring at the camp. (see photo 4) The screen and Swedish fireplace top are to prevent any embers from escaping the fire pit. At Hug-In time each year, the Hills are usually so dry that open fires are not allowed. The smoker is made with a framework of angle iron and is covered with sheet metal. The THC smoker has no wheels attached. It is not heavy; a couple of stout lads can load it into the back of the truck with ease. When the pioneer settlements in Texas started to have a bit of time to relax, the most popular thing to do was have a barbecue. I don't know if it was called a "barbecue" back then, but that is what it was. There was almost always music to accompany. The first barbecue was cooked over a pit dug in the ground. With the rocky conditions of the Hill Country, an above ground device soon was developed. Photo 5 shows the original Luckenbach community barbecue. This thing is about 50 feet long and could cook about a ton of food at one time. The iron rods across the interior held up wire grates. The practice here was to build a fire in the barbecue and, when the wood had burned down to coals, the coals were distributed as needed. Usually some sort of damp covering directly on the food kept the smoke and heat in. Photo 6 is the Johnson City VFW smoker located a couple of blocks from my apartment. It is built of concrete blocks and has metal doors on top for access. I really don't care for the paint scheme, but that is the way it is. The awful looking metal contraption at the end of the smoker is an authentic Texas Hill Country smoker. This is the ancestor of the new George Pearce smoker. It is upside down in the photo. If you turn your monitor upside down you can make out the details easier. Off to one side, out of the photo, there is a box constructed in the same manner that is used for making the coals. By the way, if you are looking for a business to get into to stimulate the economy, the Johnson City Veterans of Foreign Wars building and grounds are for sale. That includes the smoker. Shortly after WWII, someone had the bright idea of making a smoker out of a second-hand 55-gallon drums. You have seen them; you may have owned one. They were great. They were inexpensive and were large enough to feed a good crowd. Millions of them must have been made and you still can find them today. Someone whose name is lost to history saw, in a used butane tank, the ultimate smoker. As soon as the constructors learned to purge the tanks of propane residue and stop the big explosions, everyone had to have a trailer-mounted smoker. From there, things rapidly progressed to where we are today -- smokers in every size and shape imaginable. I have seen one with a built-in dance floor. I have seen one built out of brick on a trailer. I wish I could find my photo of the smoker built out of a bathtub. Barbecue is limited only by the imagination.